A trumpet-blown mazurka? A blues-y polka? An improvised waltz from the Danube? New jazz standards just might spring from age-old European traditions, even in homage to America, the homeland of jazz, as performed on local stages. A four-day and four-tiered event from October 10th to 13th, “EUropean Jazz @ UCLA” is a beacon for aficionados of the arts. Spotlighting eleven musical groups from ten countries, it can boast being “the first EUropean jazz festival ever presented to the United States.” Not only does it offer a free concert series at UCLA’s Schoenberg Hall Thursday through Saturday at 7 pm with a Sunday matinee at 2 pm, but it also includes a roundtable, open to the public, with musical guests and scholars at 2 pm on Saturday. The festival’s participating musicians will extend themselves even further by giving master classes, available to UCLA students, to enhance the dialogue about European jazz compositional styles and performance practices. Someone has cooked up a good idea! 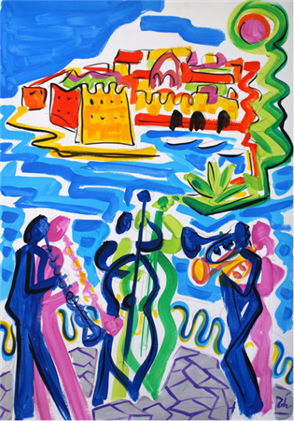 Could be that it all took off on a vibrant summer day in a Dalmatian seaside town with the boats rocking to waves of sound — the strum of a guitar, the swish of a drum, the blue notes of a horn floating on the breeze? Old and familiar melodies melting into new forms for young ears; recognizable themes finding new tones and rhythms of their own. Fans will be carried to Europe before they even cross the lobby of Schoenberg Hall into the auditorium as another kind of vibration — a visual one — fills the air with a companion exhibit of 28 posters by artist Roko Ivanda, one for each of the 28 European Union member states. 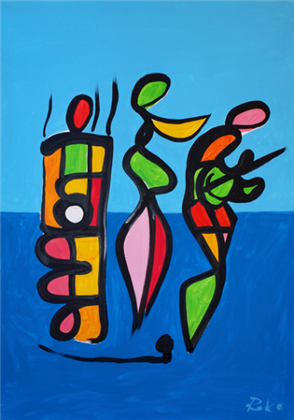 The original paintings, acrylic on canvas, were created by Ivanda in his picturesque coastal town of Vodice, Croatia, where his gallery, Ispo Kampanela (Under the Belfry), is one of the cornerstones of “Vodice Summer,” an annual nexus of art and culture. 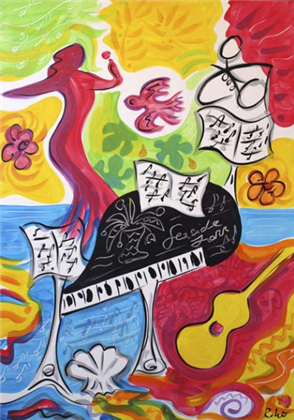 The scintillating colors and lines of Ivanda’s paintings first took their form in his “Seaside Jazz” cycle, the name of a music festival that inspired him to explore the interaction between the sonic and the visual in art, and he has since found himself enthralled with the mission of visualizing the sensations of the jazz sound within the local land-and-sea setting. Ivanda’s postmodern acrylics bring primary colors to beige bricks and gray stones. Ancient towers and sky-bound steeples dance with the masts of boats over jetties and moorings set afloat with the buoyant hues. Adriatic azure turns jazzy blue, and the town flares in the sun, a-tilt, on-the-run. Red roofs jump to tympani drums, and old cobbled steps fly with folk-notes anew. Arched walls bend like the strings of a bass, like the trill of a horn over the marina's eye. Alleys climb hills like narrow notes on the scale or swirl to the sea and prance past a palm. 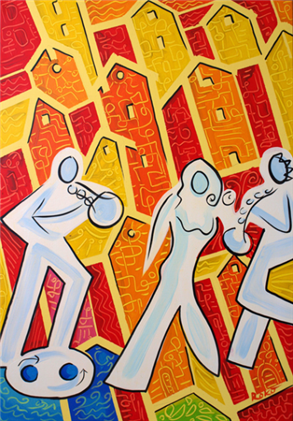 The rhythm jives — the town’s alive — and Roko Ivanda takes us there. You can hear it in the air…. Euro-jazz tips its hat to America as the cradle of the art all the while that it comes into its own and arrives at the door idiomatically intact. 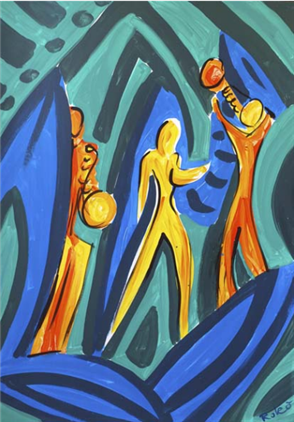 As a medium of cultural expression, jazz has historically thrived on such artistic freedom in both form and practice, so it has always called for experimentation within local legacies and innovation stemming from regional roots. 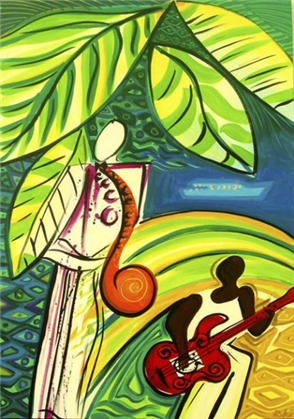 The fusion of diverse inflections — or even the syncretism of oppositional rhythms, themes, and styles — is not only part and parcel of jazz but also defines it, making jazz both rich and unique, and oddly, a universal language of liberation. A democratic turn of hand and voice sprung freely from deeply ingrained traditions on Continental soil salutes the American indigenous art form that from birth has surprised with its visceral blues. In its set-up for the stage, Borna Šercar’s Jazzianna Croatica might look the most conventional of the eleven groups performing at UCLA. Šercar on drums is joined by Tihomir Hojsak on bass, Vojkan Jocić with his sax, and Zvjezdan Ružić playing piano. Drawing from the ethnic strains of its musical heritage by presenting sounds authentic to the region, the quartet would like to introduce new jazz standards that can be identified as distinctly Croatian; so its repertory offers new compositions and arrangements embracing familiar folk themes that have time and again emerged in classical music. Two trios follow suit in the line-up for this concert series, Emil Viklický’s omitting the horn and Georg Breinschmid’s leaving out the drums. 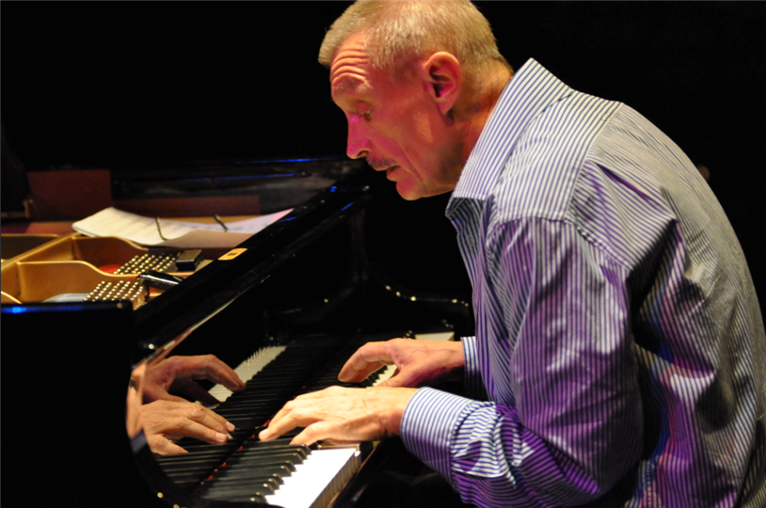 Viklický, an internationally sought soloist, performs in ensembles on both sides of the Atlantic as a pianist of modern jazz. As a composer, he adds the tones and melodies of Moravian folk songs that update contemporary jazz with a new vitality. Dustin Morgan on bass and Richard Weller on drums round out the Emil Viklický Trio from his own Czech Republic. Georg Breinschmid’s Brein’s Café adds a clarinet and bass clarinet to its soprano saxophone, all three courtesy of Vladimir Karparov who joins Antoni Donchev at the piano and Breinschmid himself with his bass. 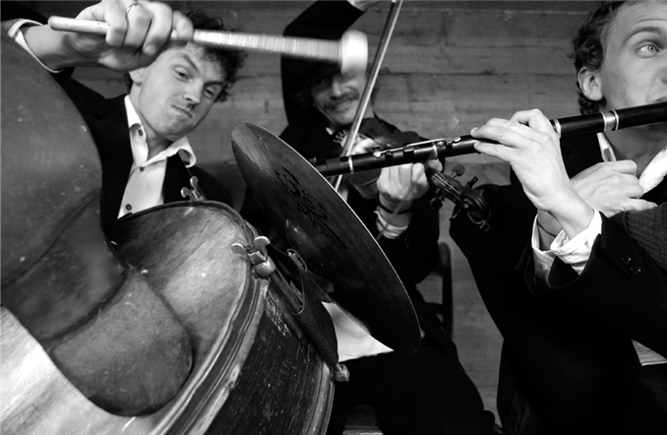 The Viennese-Balkan trio takes wing over the vast Danube region, visiting the waltz, the polka, and gypsy music in Georg Breinschmid’s new compositions that keep the jazz moving, all the while that traditional pieces are not left behind. Fans will be delighted to discover quite another approach to a very specific region by the Janusz Prusinowski Trio. Putting into play the instruments and techniques of traditional music in the village life of central Poland, the five-member ensemble combines its particular musical style with dance to push its avant-garde sounds. Janusz Prusinowski heads it all off with a fiddle, a dulcimer, a Polish accordion, and his own voice. Piotr Piszczatowski falls in with a baraban drum and a frame drum; Michal Żak follows with wooden flutes, the shawm, and the clarinet. Szczepan Pospieszalski livens it up with his trumpet. They sing, play, and dance to mazurkas as they improvise live on the stage, in step with their old masters but jazzing it up at the same time. 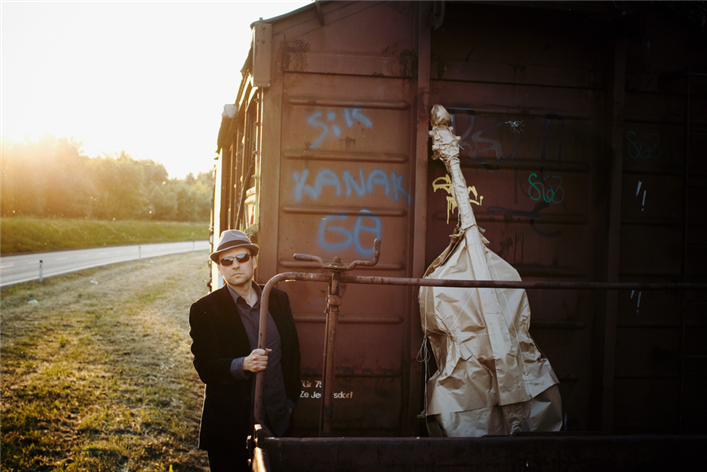 Eclectic in his own way, Finland’s pride and joy Olli Hirvonen draws from contemporary classical music, indie-rock, and experimental electronic music to perform with bassist Marty Kenney and percussionist Nathan Ellman-Bell in America’s “Big Apple” and at European jazz fests. Sans piano and horns, the trio boasts Hirvonen’s guitar — quite a variety of them. 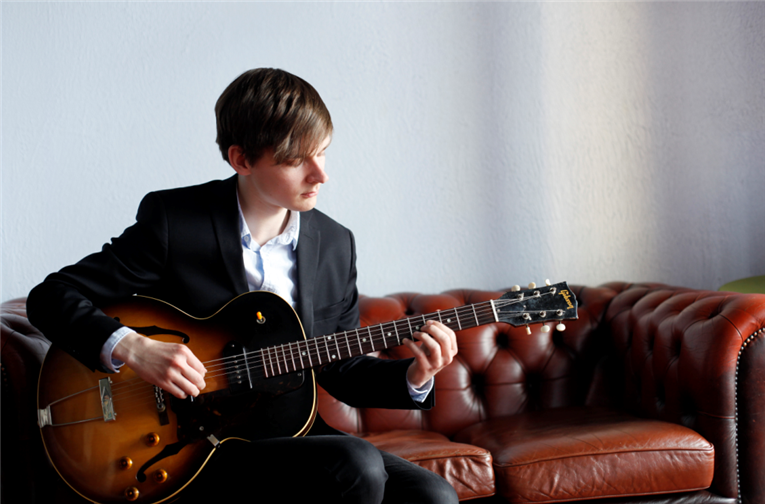 At age 22, Hirvonen was named 2011 Artist of the Year by the Pori International Jazz Festival. Since then he relocated to New York City to pursue his master’s degree at the Manhattan School of Music. Orsi and Bálint Sapszon honed their musical aesthetic in Hungary as brother and sister in one of Budapest’s musical families. Bálint, residing in Los Angeles as the Cultural Secretary of the United Hungarian House and as president of the Californian American-Hungarian Art Association, plays piano as his sister Orsi sings. She is known as a vocalist in Gringo Sztár, a favorite Hungarian pop group since 2011. For the concert series, “EUropean Jazz @ UCLA,” these six ensembles will perform with five other groups who find their own unique voices, instrumental and vocal alike, for referencing, incorporating, and experimenting with the musical sources of their native milieus: JazzIndeed with Michael Schiefel from the Federal Republic of Germany, the Melanie O’Reilly Celtic Jazz ensemble from Ireland, Moroni-Panascia-Marcelli from Italy, North Atlantic Jazz Alliance from the Federal Republic of Germany, and the Swiss Intercontinental Jazz Factory from Switzerland. Players from Moroni-Panascia-Marcelli from Italy and Switzerland have performed with American jazz legends Freddy Hubbard, Clark Terry, Zoot Simms, Herbie Hancock, Quincy Jones, Wayne Shorter, and David Liebman. Members of the Swiss Intercontinental Jazz Factory have played with Miles Davis, Sting, Herbie Hancock, Ginno Vannelli, Randy Crawford, and Frank Gambale. Their music crosses over with pop rock, hip-hop, pop, and world music, attesting to the vitality of jazz as it looks to its roots, travels, and plants itself again, perhaps far from native soil yet on rich improvisational terrain. Location and address: All events will take place in UCLA’s Schoenberg Hall, located on the first floor of the Schoenberg Music Building at 445 Charles E. Young Drive East, Los Angeles, CA 90095. Admission: Events are free and open to the public on a first-come basis, with priority given to those who RSVP in advance. Reservations will be held until 10 minutes prior to curtain, and seats may be released to stand-by patrons. Wristbands will be issued beginning at 6 p.m. for the evening concerts and at 1 p.m. for the Sunday matinee. Programs subject to change. Directions and parking: For events at UCLA’s Schoenberg Music Building, all-day parking ($12) and short-term parking (payable at pay stations) are available in Parking Structure 2 (enter the campus at Hilgard and Westholme avenues). An immediate left turn leads to Parking Structure 2. From Structure 2, walk north along Charles E. Young Dr. East to Dickson Plaza. Enter the Schoenberg Music Building from Dickson Plaza.